The Amethyst Gemstone is called as Katela in Hindi and is used as an Uparatna/ Superior Semi precious alternative to the Blue Sapphire. A Gemstone blessed with superior healing abilities it is a very good option for those seeking detoxification, relaxation and de addiction especially in case of alcoholism. The total number of unheated and untreated gemstones makes up less than 2-3% of all Gemstones in the world and Gemstones that get classified as Jyotish Gemstones form a miniscule percentage of this 2-3%. Several parameters go into making a Gemstone a Jyotish Gemstone and amongst these parameters one of the most important one is clarity. If the answer to that question is no or maybe you can be sure you do not have a Jyotish gemstone and there is no further need to go into technicalities. Even though the perception of beauty is different for each person a majority of people are able to fairly classify and agree on statements such as Beautiful, Not Beautiful or nothing special. Featured today is an exceptionally beautiful Amethyst from Zambia set in silver pendant a true testimony to what Jyotish gemstones are all about. All Natural and untreated amethyst in which the deep Siberian royal purple colour is evenly distributed. Notice that the colour is spread evenly in the whole crystal and is not concentrated in one particular area. The beauty of colour combines with the eye clean clarity and high lustre and brightness with an exceptionally symmetric octagonal cut to bless this gemstone with exceptional beauty. View the video to appreciate and gauge the clarity levels. 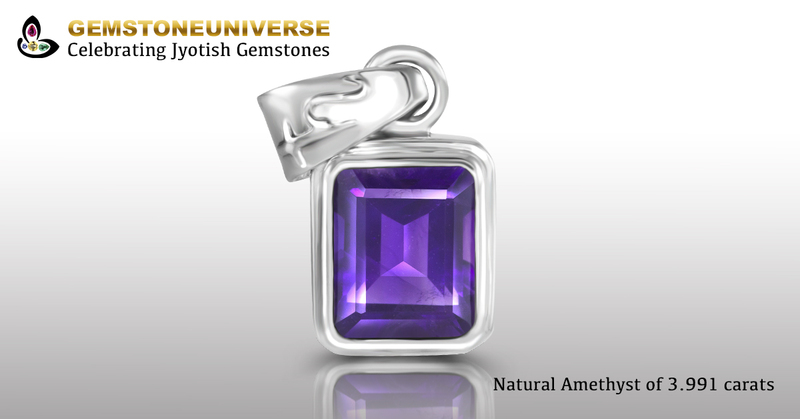 The Amethyst is set in a silver pendant with the Sacred Saturn symbol on the pendant loop to make a powerful Jyotish Talisman that shall deliver results only true Jyotish Gemstones are capable of.